after sue’s amazing performance qualifying for the world triathlon championships this year in London, it was up to the boys. dave k, rod and i took on the sea swim triathlon in Llandudno, hoping to emulate our fantastic club-mate. very late start to our race 4.15pm, it’s the first time i have ever raced at this time, makes the race day very long, but does let you sleep a little later and have lunch before you get started, it is a long wait though, and i would much rather race early in the morning. i went for my usual pre-swim warm up run, just 15mins, helps me keep my head straight and focus on the race. i got back and put on my wetsuit only to be told by craig via jackie, sue and hannah, that my bike had been knocked off the rack by another competitor in a different heat. i just had time to run back (in my wetsuit) to the rack and just as well. my bike had been put back on the rack in a different position and facing the wrong way, my helmet was 5 bikes away and my glasses 3 bikes away. i quickly sorted it and ran back to the start. fantastic info from the gang, would have been a nightmare to sort that one out after the swim! all was good i arrived back at the start very warmed up after my extra run! 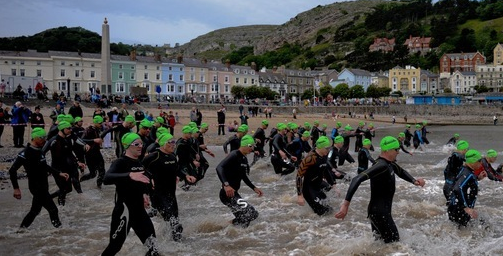 it was a deep water start in Llandudno, with all 3 nhtc (north haven triathlon club) athletes in the same age group. dave made a fantastic point, at a very poignant time, the race start line was between a monument on the promenade, and a canoeist. we had all bowed into a big semi=circle before the start and we needed to move forward, a great shout from dave, making a big difference to our start! the swim was straight out keeping the buoys on our right, round the 5th one and back parallel to the beach again keeping the buoys on our right, until the final buoy this time on our left, round that and head straight toward the shore. the swim itself wasn’t too bad, bit feisty at the start, as always but pretty decent even round the 5th buoy, it seemed a lot faster once we were heading back, definitely caught the current. as i mentioned, a very long narrow transition, up to my bike, yippee it was there, with my helmet and glasses intact. i had a wee bit difficulty getting my wetsuit off, need to be quicker at that, about 10secs lost. then off running through this very long transition, very difficult to pass slower athletes, but i made myself known. great jumping bike mount and i was off, leaving 3 or 4 triathletes fiddling at the start line. i always run past the start line and mount if there is traffic. the bike course was 2 laps around the great orme, a bit hilly, but i love that, i exited the water in 30th position, time to make up some places. i am quite a good climber and very light, so the hills don’t bother me so much, i just race them as hard as possible, thinking if it’s hard for me, it’s even harder for them to see me pass by, all the time pretending not to be breathing too hard haha. the course really suited me, a lot of climbing and a wee tricky descent down the back, then into the town again and round for the 2nd loop. i smashed the bike making up all the places i had lost in the swim, coming into t2 in first place, i had a much better t2, but still time to save, must get my shoes on quicker!!! off on the run, pan flat along the promenade for 2km, then a wee pull up to the turnaround point, downhill and back the way we came. with about 2km to go i was passed by a guy in my age group who was flying using the small downhill to his advantage. i tried to stay with him for a bit, but he was too fast, i then felt someone immediately behind me. he sat there for a while, but you never know whether its someone from your ag or not. he then put a spurt on and passed my with just under 2km i reckon to go. it was then i saw he was also in my age group, i chased him for about 500m but he too pulled away. i was running as fast as i could, but unfortunately couldn’t make up the gap. the guy in 2nd place was making up on the 1st place guy but ran out of race, i managed to keep the gap the same for the last 1km, but ran in 31secs behind the winner of our age group. i was 3rd and knew i had qualified, i immediately wanted to know where rod was, he was not far behind me and we thought he was in 5th place so had also qualified. dave came in not much later and had a fantastic race, unfortunately losing his timing chip! i was delighted that rod and i had qualified, but in truth a wee bit disappointed about being passed in the last 2km, going to work on that for London. ps: my race number in Llandudno was 13, karens birthday is the 13th, the year is 2013 and the world triathlon championships is on friday 13th september, maybe 13 is lucky for me? unless of course i come in 13th!!! pps: a very special thank you to jackie, craig n hannah and sue for their fantastic support and wonderful encouragement.